Follow the following links for guaranteed fun! Wanted: High School Co-Op Student! Do you know a high school student in grade 11 or 12 who is energetic, responsible & crafty? We are looking for an outgoing and responsible high school co-op student for the Fall term who is willing to try to new things and embark on an adventure with us! The placement could be at Workshop or at Flock (or both!) and involves fun things like making creative window displays, dressing mannequins, opening stock boxes, button-making, fabric cutting, screen printing. It also includes less-than-fun things like tidying, organizing supplies, cutting down cardboard boxes and steaming clothes. Punctuality is important. A positive attitude is essential. Know someone who would be a good fit? Have them email us at info@workshopboutique.ca. June 28 . Silkscreening Demo. High Noon. Since we renovated in February and opened our brand fancy studio, many of you have been asking us to do demos! Because we are (obviously) completely obsessed with crafting in almost any form, we get very excited at the idea that our studio shop could become somewhere that Ottawa’s crafty community might come to exchange ideas and to get inspired! Silkscreening 101: Madeleine will be showing off the basics of silkscreening and answering questions from noon – 1pm on Saturday, June 28th at Workshop (242 1/2 Dalhousie St). You can also check out the goodies we have been making over the last few months! P.S. 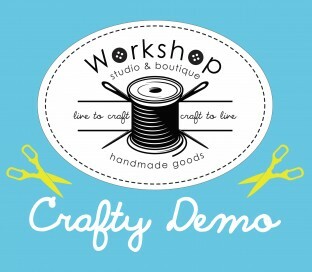 We hope to do crafty demos on a regular basis, so stay tuned! Spring Trunk Sale! March 20-24th. Get Ready. We know how much you love it, so we’re doing it again! 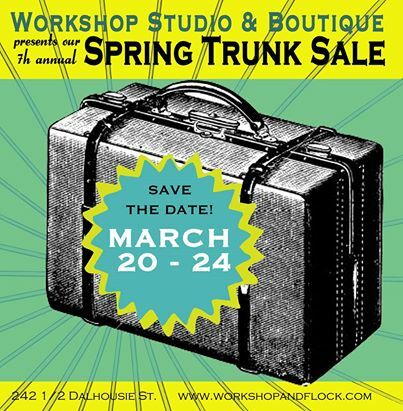 Workshop’s always fun and crazy SPRING TRUNK SALE will be happening March 20-24th this year! The fun doesn’t end there though, because we’ve decided to officially hold the sale over for the whole weekend – this is for those of you who give us those sad puppy dog faces when you can’t make it the night of the event. But don’t forget that after Sunday at 5pm, everything magically turns in to a pumpkin (goes back to the designers), so don’t miss it! For those of you who are new to the cult of the trunk sale, here are the basics: once in the Spring and once in the Fall Workshop invites a few of their favourite designers to participate in our trunk sale: they ship us tons and tons of great clothes, accessories and jewelry which are from past seasons collections, slightly damaged items, weird sizes (the xs people clean up at this event! ), samples, etc! Our designers get to clean out their studio spaces and our customers get to pad their closets! the deals are great – up to 70% off! More details and sneak peeks can be found on our facebook page! Put it in your calendar and don’t forget to join us – especially if you haven’t yet been down to check out our newly renovated space (yellow)! Today is our very last day of our big 28 Days of Giveaways! Of course that doesn’t mean that we’ll stop giving stuff away (’cause that would be boring) but it does mean that you only have one more chance to win in our mega-contest! 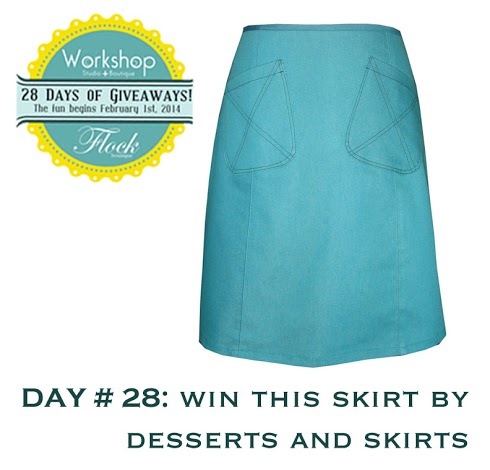 We decided to end with a bang by giving away this classic and fun skirt by Toronto designer Nicole Boudreau of Desserts & Skirts. I’m pretty sure that this skirt (think stretch denim) would fit after quite a few desserts and, in the name of science, I’m going to try it out. Anyone in? Win it today and you can head out to Thyme & Again or Supply & Demand or Town, and try it out for yourself! Contest closes at midnight tonight. 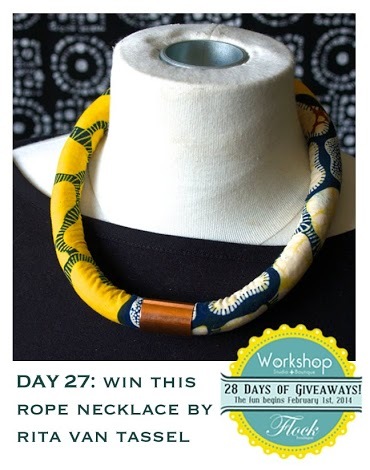 It’s the next-to-last day of our big Month of Giveaways and today our focus today is on finding a great new home for this gorgeous fabric necklace by Halifax designer Rita Van Tassel. In her own words, Rita’s “philosophy is that quality stylish goods can be responsibly made and sold at a price which both supports the maker as well as pleases the buyer”. Which is exactly what our shops are all about. A perfect fit. So, join me on my current journey of all things beautiful, Canadian and handmade and win this piece today! Back in the day, Christina & I owned a silkscreened t-shirt emporium and Mie, of Water Willow Design, was our absolute favourite designer! Her prints were lovely florals on calm coloured tees and they made us feel like sipping some calming chai and heading out to a Yin class. Things have changed in our world since then (now we have our feet in a backyard kiddie pool while drinking dark & stormies in lovely dresses with just a bit of spit up around the neckline) and in Mie’s as well. She moved from Montreal to Ottawa (well, Chelsea to be exact) and she started doing her florals on jewellery. Even better. 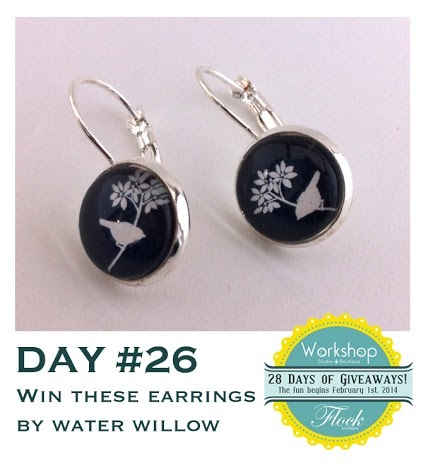 Today we’re giving away this pair of Mie’s earrings as part of our big 28 Days of Giveaways. Win ‘em! Contest closes at midnight. When the lovely Rita began selling with us some 7 years ago (eek!) we had no idea her classic but vibrant designs would become such a staple at both of our shops. 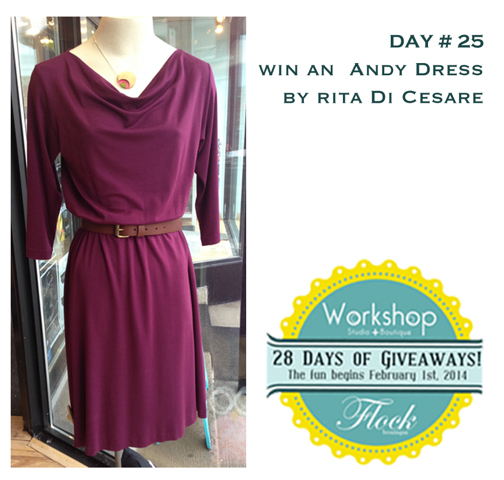 Check it out for yourself at Rita di Cesare and you’ll see what why we are such fans! Joanne, friend of the shops and part time Shopgirl, bought this Andy dress in sapphire and looks smokin’ on her – the fit makes it an easy wardrobe staple and the colour provides the va-va-voom! We’re nearing the end (sniff, sniff) of our big 28 Days of Giveaways but we’re not done yet! 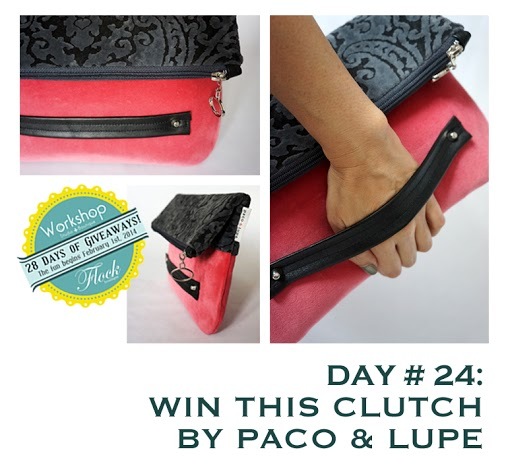 Today one lucky person will win this striking (and practical) clutch by Montreal designer (and very busy person!) Celia of Paco & Lupe. WIN IT today! Contest closes at midnight tonight. In 1998, Sarah Mulligan took a wrong turn down a hallway in the School of Craft and Design building at Sheridan College. That day she discovered the glass studio, entered the program, and presto chango: we have her unbelievably beautiful collection of glass jewellery in both of our shops. 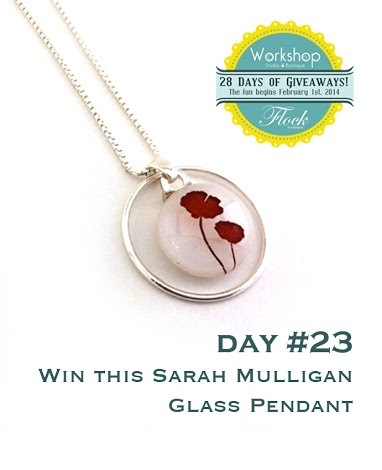 Today, on Day 23 of our epic 28 Days of Giveaways, we are giving away this glass pendant by Sarah Mulligan. Enter below. Contest closes at midnight. 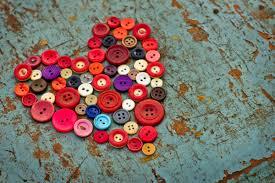 Sign up to receive the latest news from Workshop Boutique & Flock Boutique!